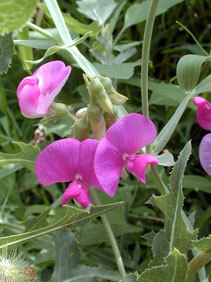 Also Called: Everlasting pea, perennial pea. Stems: Vine, trailing or climbing via tendrils, 3 to 7 feet long, glabrous, waxy, conspicuously 2-winged; wings 1/5 to 2/5 inch wide. Inflorescences: Raceme, 5- to 15-flowered, on stalk 4 to 8 inches long. Flowers: Showy, odorless; stalk 1/2 to 1 inch long; calyx bell-shaped, 1/6 to 1/4 inch long; lobes 5, unequal; corolla papilionaceous, 1/2 to 1 inch long, pinkish-purple, rose or white, sometimes stripped; banner nearly as wide as long; stamens 10, 9 united, 1 free. Fruits: Pods, linear, 2.5 to 4 inches long, 1/4 to 2/5 inch wide, flattened, glabrous, 10-15 seeded; seeds oblong, 1/5 inch long, dark brown, surface rough. Habitat: Fence rows, roadsides, waste places; frequently near farms or homes. Origin: Introduced from Europe as a graden plant and escaped from cultivation. Comments: Very hardy. Will form a dense mat 18 to 30 inches thick when there is nothing for it to climb on. May become weedy or invasive in some habitats.